The New York City Department of Transportation (DOT) came to SVA's Interaction Design MFA program with a brief to design a digital interaction at the Canal Street Triangle that would be useful to both residents and tourists. 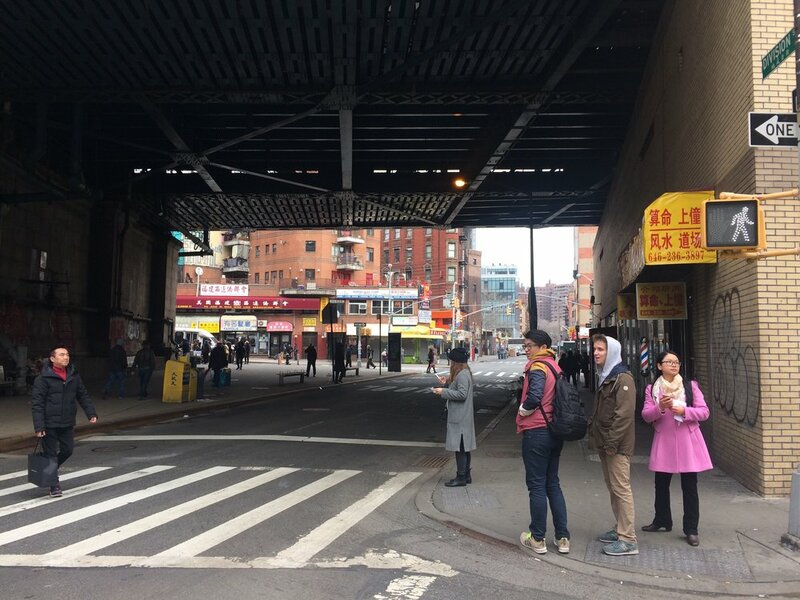 The Canal Street Triangle is one of seven locations in and near Manhattan’s Chinatown that the DOT is looking to redesign. Interviews with 28 people, including tourists, local visitors to Chinatown, residents, business owners, and community leaders, helped us to form and iterate on our ideas. At the end of eight weeks, we presented our final concept: Uncovering Chinatown’s Living History, a bilingual resource for residents and tourists. The components of our proposal are a timeline that reveals and celebrates Chinatown’s rich history, inlaid onto the sidewalk, and a double-sided interactive screen; on one side, a photo map exposes visitors to Chinatown’s hidden gems, and on the other side, a digital bulletin board promotes the neighborhood’s broad range of creative energy, from brush painting classes and workshops to panel discussions and resources for recent immigrants and refugees. We presented our concept to Neil Gagliardi, Director of Urban Design at the Department of Transportation and Wellington Chen, Executive Director of the Chinatown Partnership in February 2017. Our team at the Canal Street Triangle. The seven gateway locations presented to us by the NYC DOT. We started by conducting online research to learn about Chinatown’s past and present. We also looked for opportunities and inspiration by finding out what other public installations exist in public spaces across New York City, the country, and the world. A key takeaway from this introductory phase was the prominent roles small businesses have played during Chinatown’s entire existence, helping to support waves of immigrants coming from different parts of China then and now. 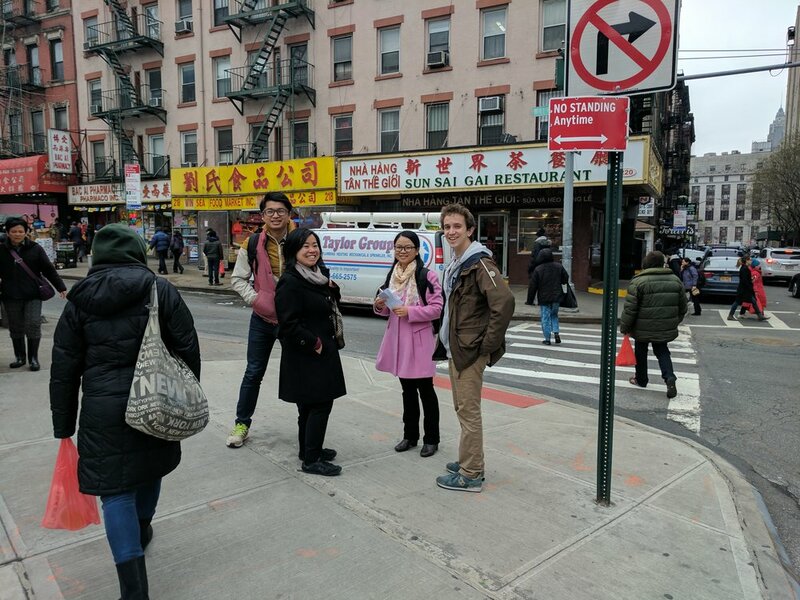 We conducted primary research throughout the eight-week project, beginning with visiting the site of the proposal, the Canal Street Triangle, and observing how people interacted with the current kiosk. We also visited Columbus Park, the New York Chinatown Senior Center, and the six remaining gateway locations the DOT plans to revamp. In our interviews, we sought to discover the pain points that both tourists and residents feel in Chinatown, and how an installation in a public space could be a solution. In total, we spoke with 28 people: 17 tourists and 11 residents. Local press was a critical component in helping us to identify relevant stakeholders. Open City Mag, a project of the Asian American Writers' Workshop, proved to be a reliable resource for a truly local point of view, and helped us to connect with four key interviewees: Olympia Moy of the Florentine School, Aaron Reiss, cartographer of the Museum of Chinese in America’s Chinatown Map, and Gary and Mei Lum, the father and daughter owners of Wing on Wo, the oldest business in Chinatown. There is plenty of culture in Chinatown, but it is hidden to most visitors, whose experiences generally only include food and knock-off souvenirs. Visitors would appreciate a more meaningful experience in Chinatown, and residents are eager to share that with them. Chinatown has been suffering from economic challenges due to high rents, changes in consumer habits, and a difficult recovery after 9/11. There are still local businesses that have been in operation for decades, but Chinatown needs innovative interventions to help these businesses and new small businesses thrive. Locals are not aware of events happening in Chinatown We learned there are several nonprofits using art to both connect to Chinese culture and as ways to help empower immigrants, but there is no central place to find out about these events. In identifying our target audience, we felt it was important to focus on both locals and visitors. The Canal Street Triangle is in a prominent location that both tourists and locals interact with. For both groups, we wanted to expose the richness of Chinatown, giving tourists an opportunity to go beyond an often superficial Chinatown experience, and for locals, awareness of all of the activity happening in their community. One of our interviewees said something that really struck a chord with us. We think this really encapsulated everything we’re trying to address with our proposal. Residents told us about Chinatown’s unique history, including stories from their own family’s history. We learned about the garment industry that thrived in the ‘70s and ‘80s and that both Sun Yat-sen and Geraldine Ferraro had lived in Chatham Square. These important figures in history had a hand in shaping Chinatown into what it is today, and tourists are eager to learn about it. An early sketch of the timeline inlaid onto the Canal Street Triangle. The first pitch for the timeline included different branches which would each focus on specific topics such as architecture, business development, and immigration patterns. It also included interactivity; sensors would detect when a visitor was hovering over an event, and lights would turn on. In the end, the timeline concept we presented was an iron or stone inlay, with one path leading to an interactive photo map. We decided to simplify this part of the concept for a few reasons: the Canal Street Triangle is a small space that’s often crowded, so it would be difficult to convey a lot of information on the sidewalk, and we were aware that the DOT’s budget is only $1 million, which we thought would be better spent on the interactive photo map—Chinatown’s living history. Every tourist we spoke with went to Chinatown for food, but when we spoke with residents, we learned there’s much more to Chinatown and Chinese culture than its food. The interactive photo map would help visitors with wayfinding, and also reveal the unique experiences offered in Chinatown that are off the beaten path, such as the button shop that doubles as an art gallery, or the Chinese opera karaoke happening at Columbus Park. In an early presentation of the photo map, we suggested that it be crowd-sourced and linked to Instagram. Through testing our concept with residents and tourists, we realized it would be too time-consuming to curate these photos, and it would be more valuable to both tourists and small businesses to use professional photography on the photo map, along with well-written descriptions. These beautiful shots and short vignettes would help expose the parts of Chinatown that may not be in travel guides, and draw visitors to small businesses. We still liked the idea of engaging users through social media, so we included an Instagram hashtag for users to submit their photos for a chance they would be selected for the photo map. A rendering of the digital bulletin board by teammates Wei Ting Kuo and Yue Lilian Yuan. Our early concepts only consisted of the historical timeline and the interactive photo map, but after interviews with residents, we realized locals need an information hub. This digital bulletin board has the potential to help revitalize Chinatown by publicizing classes, workshops, and other events to residents and the greater Asian American community of New York City. This bilingual feature would also serve as a lifeline for recent immigrants and refugees who may be vulnerable and need access to accurate information and a handful of trustworthy organizations that could help them. This feature would be especially useful at many of the other gateways which are situated in the more resident-centric parts of Chinatown, like Chatham Square and Division Street. The design fiction we created to present our concept to our stakeholders went through many iterations, as additional research informed refinements to it and our concept. Our first draft followed only one character visiting from Amsterdam, who learned about the history of Chinatown from the timeline and found a place to eat from the interactive photo map. The research we conducted helped us to create a much deeper story, demonstrating how our concept could improve the lives of locals and tourists, as well as help to increase exposure for the small businesses that are the backbone of Chinatown's local economy. Wei Ting Kuo illustrated each frame of the design fiction, with help from Yue Lilian Yuan. I wrote the story, with editing help from Alex Frankel. I also narrated the design fiction. Wei Ting pulled it all together in Adobe After Effects. When we pitched our concept to the DOT and the Chinatown Partnership, we emphasized the importance of codesigning the installation with the community. Chinatown is a unique neighborhood that’s densely populated by businesses and residents; involving the community is critical to the success of any new public installation. Cooperating with the community’s nonprofit groups would also help with generating content for all aspects of the installation. For example, Open City Mag has already done excellent reporting on Chinatown, and organizations such as the W.O.W. Project, CAAAV, and the Chinatown Art Brigade frequently hold events that are open to the public.